Patients are considered high-risk when possessing a greater than 20% lifetime risk of breast cancer. Numerous breast cancer risk assessment tools and calculators are available, though ones that heavily weight family history are preferred such as the Claus, Tyrer-Cuzick, BOADICEA, and BRCAPRO models. 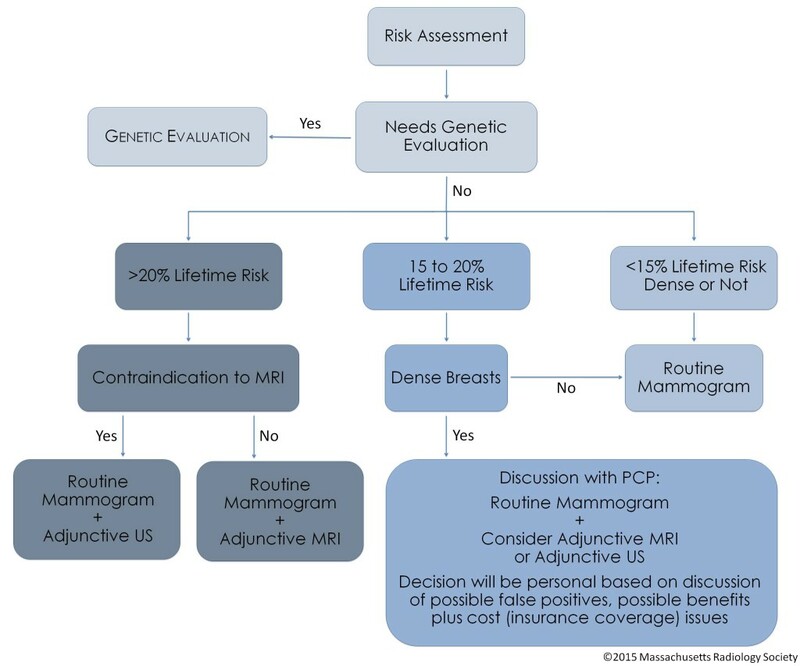 Based upon these models, if a patient is deemed high-risk, the American Cancer Society recommends adjunct screening breast MRI, as MRI is more sensitive than ultrasound and has fewer false positives. 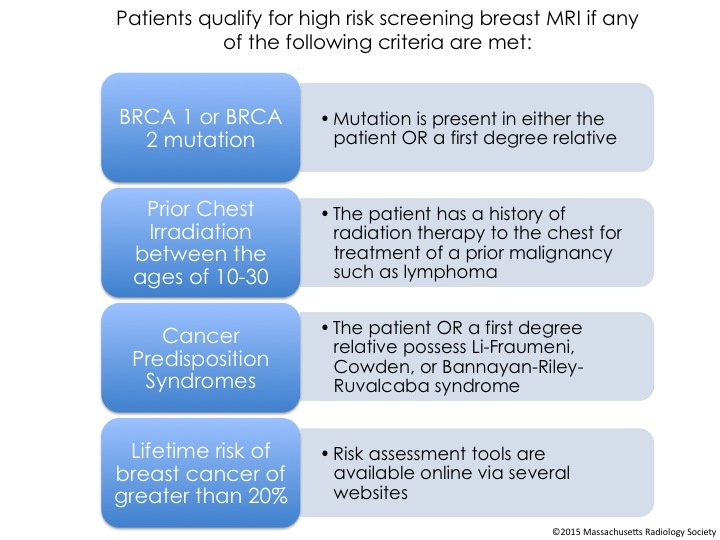 Additional criteria that qualify a patient as high-risk include BRCA 1 or BRCA 2 mutation (in the patient or first degree relative), cancer predisposition syndromes such as Li-Fraumeni, Cowden, or Bannayan-Riley-Ruvalcaba syndromes (in the patient or a first degree relative), or a history of prior chest irradiation between the ages of 10 and 30 years. Again in these patients, adjunct screening MRI is recommended, as MRI is more sensitive than ultrasound and has fewer false positives. 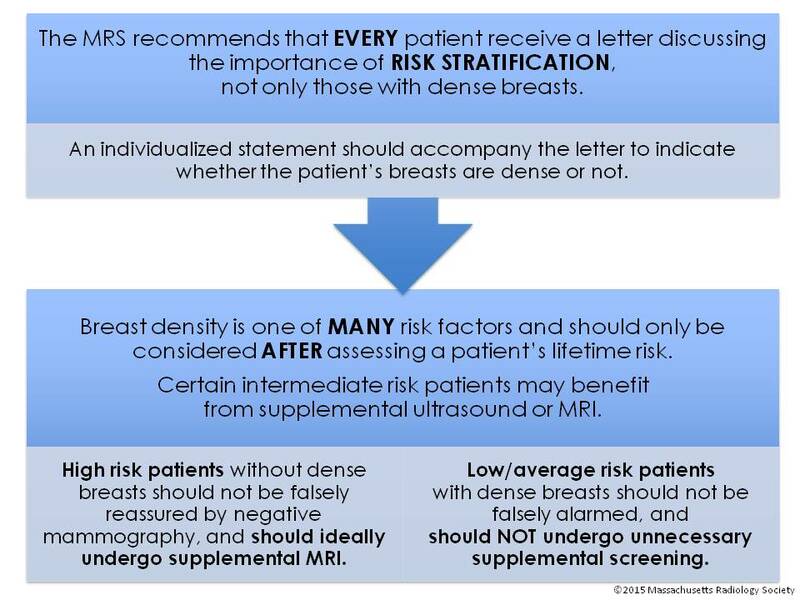 There is no data to suggest that widespread supplemental screening (MRI or US) is beneficial. 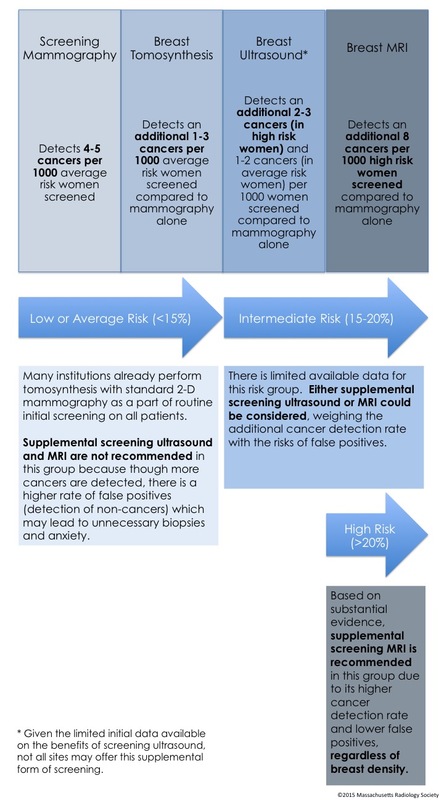 Although there is a small increase in incremental cancer detection in these women with supplemental screening, the large number of false positive tests is concerning. Thus, supplemental screening is generally not recommended in this group.